Numerous species of termite, whose societies are founded on hierarchies of kings, queens, soldiers, and workers live in tall nests that are ventilated by an intricate system of tunnels. The nests, also called mounds, jut from the ground like skyscrapers and can grow to about 7 meters in height. They are also self-ventilating, self-cooling, and self-draining—but thus far the mechanisms behind these climate control features have remained unidentified. A team of engineers, chemists, biologists, and mathematicians lead by Imperial College London, the University of Nottingham, and CNRS-Toulouse in France, have currently explored how these nests work much more closely than ever before using 3D X-ray imaging. They discovered evidence about how the small holes, or pores, in the walls of the mound help termite homes stay ventilated, cool, and dry. Termite nests are a unique example of architectural perfection by insects. The way they’re designed offers fascinating self-sustaining temperature and ventilation controlling properties throughout the year without using any mechanical or electronic appliances. Dr Kamaljit Singh, Study Lead Author, Department of Earth Science and Engineering, Imperial College London. In their new research, published in Science Advances, the scientists sourced termite nests from the African countries Guinea and Senegal and examined them using two kinds of 3D X-ray imaging. To start off, they conducted a low-resolution scan of the nests to measure the nests’ larger structures, such as walls and corridors termed as channels. Based on those images they calculated the thickness of the nests’ outer and inner walls, as well as the structural particulars of inner channels which termites use to move around the nest. The scientists learned that networks of larger and smaller pores in the nest walls help swap carbon dioxide (CO2) with the outside atmosphere to improve ventilation. 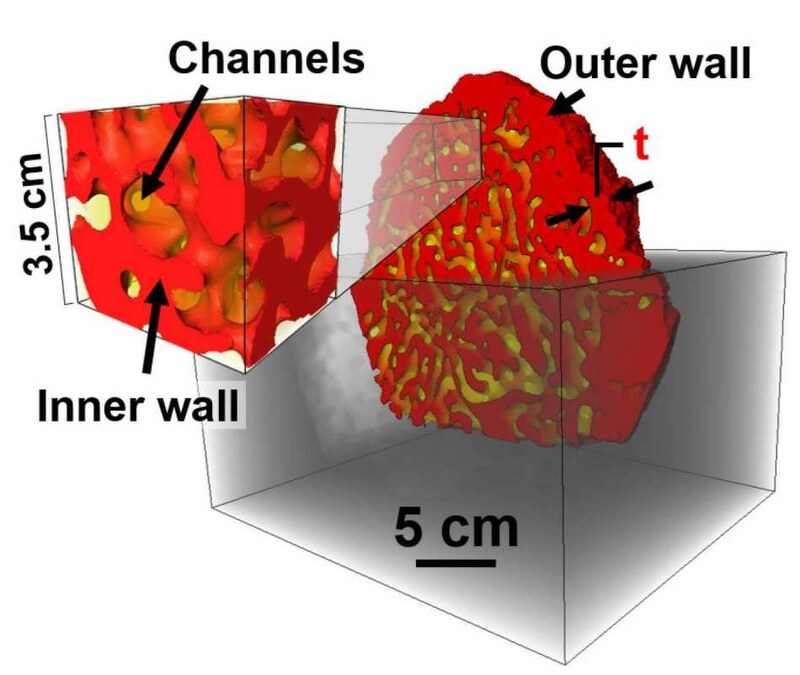 Larger micro-scale pores are found to be completely connected all through the outer wall offering a path across the walls, and by using 3D flow simulations, the authors revealed how CO2 travels through the nests to the outside. The simulations exposed that the large micro-scale pores in nest walls are beneficial for ventilation when the wind outside is faster, as CO2 can exit easily. However, when wind speeds are slower, the larger pores can also help to discharge CO2 through diffusion. Nests can be typically found in hotter regions, which mean they have to keep cool. Actually, the authors learned that the larger pores also help control temperatures within the nests. The pores, which can be found in the outer walls of the nest, fill with air which minimizes the heat entering via the walls—in the same way as how the air in double glazed windows helps retain the heat inside. Bearing in mind the important role the pores play, the researchers also speculated what takes place when it rains and the pores become jammed by water. They discovered that the nests use “capillary action”—where liquid flows via tiny spaces without external help from gravity—that pushes rainwater from the larger pores to the smaller pores. This guarantees the larger pores continue to stay open to maintain the ventilation of the nest. The researchers say the recently discovered architecture within termite nests could help us improve temperature control, ventilation, and drainage systems in buildings—and optimistically transform them to be more energy efficient. The findings greatly improve our understanding of how architectural design can help control ventilation, heat regulation, and drainage of structures—maybe even in human dwellings. Our findings could help us understand how to design energy efficient, self-sustaining buildings. Pierre Degond, Study Co-Author and Professor, Department of Mathematics, Imperial College London. We know that nature holds the secrets to survival. To unlock them, we need to encourage global, interdisciplinary research. This study shows we have a lot more to learn from Mother Nature when it comes to solving even the most important 21st century problems. Dr Bagus Muljadi, Study Co-Author, University of Nottingham. This study was sponsored by the Engineering and Physical Sciences Research Council (EPSRC), the Royal Society, and the Wolfson Foundation.